Volkswagen’s GTI is great, but as today’s Nice Price or Crack Pipe R32 proves, sometimes more is better. Will have to see if the over the top nature of this hot hatch includes its price. Are you ready to have fun? I said: ARE YOU READY TO HAVE FUN? No? Okay, just asking. For those who are looking for a good time you needn’t look much farther than yesterday’s crazy 1969 Ford Cortina wagon and maybe the parts counter at your nearest Pep Boys. Sporting a Mazda mill and looking like something sketched in a 7th grader’s history notebook, not even an unfinished nature could stop the Cortina’s modest $3,500 price from earning favor, and it carted home a narrow but decisive 56-percent Nice Price win. Yesterday’s Ford represented one kind of fun, the sort that paid homage to youthful drollery. It was sort of a fart joke with wheels. What to do however, should your aspirations for entertainment demand a more mature approach? 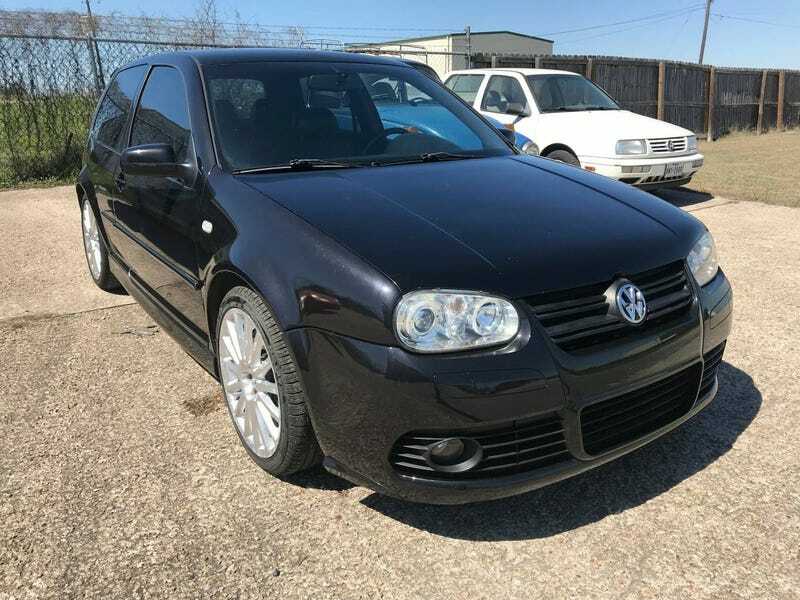 Might you eschew yesterday’s Driving Miss Crazy for something more serious, perhaps something like this 2004 Volkswagen R32? The R32 was VW’s ultimate expression of the hot hatch concept as realized on the Mk4 platform. Actually—let’s be pedantic here—the R32 really rides on the Audi TT Quattro platform. Okay, it’s not Audi’s Quattro drivetrain under it either, it’s VW’s 4motion system with a Haldex center diff. Ugh, never mind, I’m not going to try and make all the connections between the TT and the R32. Just suffice to say, they’re kissing cousins under the skin. Speaking of that skin, this 2004 R32 may look a little odd to you from the front. That’s because the front bumper has been replaced with one that replicates the bumped-out nose of the Mk5 Golf. Why? Who knows? Maybe the seller just liked it better. The rest of the car, in Black Magic Pearl, seems to be in decent shape, with correct badging in back, and riding on the factory 18-inch OZ Aristo wheels. Pop open a door and your met by a pair of highly bolstered sport seats in black leather. They don’t seem to be the factory seats however. Those were by König and were embroidered with the R logo on the backrest. You can see that artistry on the back seats here, but the front seats are unadorned. They also have separate headrests and I believe the Königs have integral noggin knockers. Everything else in the interior, save for some peeling carpet in the load area, seems intact and serviceable. Under the hood lies the car’s motivating force, a 3.2-litre edition of VW’s ponytail scrunchie of a V6. That 24-valve VR6 provides the numeric portion of the car’s name, and pumps out 240-horsepower for good measure. The 2008 R32 was VW’s first car to offer a dual clutch gearbox, however the ‘04s all sported the simpler, albeit somewhat vague, six-speed stick. Mechanical updates to the drivetrain here include a new timing chain, some suspension consumables, and fresh fluid in both the gearbox and Haldex diff. The seller says that the car comes with 112,000 miles and a clean Texas ‘blue’ title. What the hell is a blue title? Does that mean it’s adults-only? Maybe that it’s pitiably sad? No, the deal is that they color code titles in Texas and blue means that the car is approved by the state for road use. A blue title can be a ‘rebuilt salvage’ car that has passed state inspection, but this one appears to be unblemished. That still doesn’t explain the issues with the nose and seats, however. Volkswagen built 5,000 R32s for U.S. consumption in 2004. Of those, just 750 were offered in black. This one has some authenticity issues, but nothing that can’t be fairly easily rectified if you’re of a mind. The big question is the price. The asking is $8,750, which if you’re up on all things Volkswagen runs on the low end of the R32 spectrum. Does that make it a killer deal? What do you think, is this R32 worth that kind of money? Or, is this a hot hatch—the hottest VW hatch of its time—with a price that leaves you cold? H/T to Shortshift for the hookup! At $3,500, Would You Old School Rule In This Wild 1969 Ford Cortina Wagon Project?